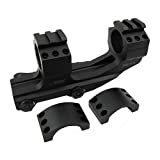 Do you happen to be looking for AR 15 scope mounts with quick release? We’ve put together the 5 best AR15 detachable scope mounts for you and reviewed them. If you own more than one scope or like to change between your scope and iron sights you need a QR scope mount for your rifle. They’re too convenient to not have. If you’re on the fence when it comes to AR15 scope mounts with quick release then some of the information below may help you make a decision. We’ve put together valuable information and real-life situations where a quick release or quick detachable scope mounts have been helpful. How many scopes do you have? If you’re a gun enthusiast you likely have several different scopes or plan on having more than a single scope in the future. Different scopes excel in different areas so odds are you’re going to eventually have a couple. Do you want to go through the trouble of the full process of mounting a scope on your firearm each time you change scopes? Our recommendation is to have a scope mount for each scope you have. If all of your scope mounts are quick release mounts you don’t have to be bothered with unscrewing mounts and replacing them with new ones. Quick release scope mounts save you a lot of time and trouble in this aspect. Since quick release scope mounts usually stay with a single scope that scope is likely to stay near zero at all times. Sometimes you may have to make a small adjustment but with a good quick release scope mount your scope can stay precisely in zero. This makes owning a couple of different scopes extremely easy. You don’t have to level them and put in as much effort into maintaining each scope. Instead, you’re able to pop on and off your scopes as needed. You can also store a scope and when you bring it out after a years time you can expect it to still be zeroed. If you’re new to the whole detachable scope mounts thing don’t worry but these type of mounts of have wildly popular overseas in Europe. Since Europe doesn’t observe shooting hours the same way we do in the United States they lean towards different types of scopes. Even though their scope preferences are little different they have had a love for detachable scope mounts for decades before we began adopting them more commonly. It’s more common for an EU hunter to carry their scope independently from their rifle. They’ll often just attach the scope once they arrive for the hunt. They trust their quick release scope mounts that much. In today’s times, this may seem like the case for more and more people. However, before we began adopting these types of mounts you would only see a US hunter with his scope already attached. With the way more and more people begin to use these type of mounts it becomes more obvious how useful they really are. The classic or “main” sporting application of detachable mounts was for rifles intended to hunt game such as buffalo, bears, and other game that’s considered dangerous. The main benefit was if you landed a nice shot on your target and it escapes into terrain harder to maneuver in you could remove your scope and use the iron sights to finish off your hunt. You didn’t want to track your target down with the scope still attached since this made it harder to target and shoot the following rounds to put your target down. The quick release scopes also came in handy if the weather changed and you need to aim during a rainstorm. Iron sights are more beneficial during rainy weather. Even if you’re someone that can’t see themselves swapping off a scope in favor of iron sights too much magnification can be dangerous to use on close targets. You could instead quick release to another scope using a quick detachable mount with a low-powered scope turned all the way down. This way you still get the benefit of using an accurate scope but one more suitable for the situation. Either way, this is what makes quick release scopes very useful for hunting or other situations. Traveling with a firearm is already difficult. Trying to travel with two is just double the headache. Instead, it’s much easier to travel with one firearm and several scopes. With today’s detachable scope mounts being as reliable as they are you can just about claim them to be “detachable and pre-zeroed” between swaps. Having each scope with a detachable mount means you don’t have to take as many firearms and it just makes traveling a lot easier. You can take several scopes without anyone questioning you about your intentions. Even though I like to think today’s detachable quick release scope mounts are so great I still recommend checking zero when swapping out scopes. Below you’ll find our breakdown of each detachable scope mount that we’ve linked to at the top of this article. We will go over the pro’s and cons to help you get a better understanding of which one may be most ideal for you. We cover the problems other people have had and what other real users of these products liked. 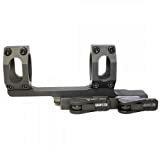 The Burris 410344 quick detach mount is an extended facing mount made with very durable materials. Even though these products go through some rough conditions when you’re hunting or just out having fun shooting it still comes with a warranty for life. This particular scope mount also has Picatinny tops so you’re able to include a secondary attachment above your scope. Other customers state they also include smooth top rings but it doesn’t state this in the actual listing. This mount does feel a little “too heavy” almost in an unnecessary way but I’ve always found this to be a sign of a better quality product. Throughout all the customers we’ve come across everyone says this mount holds its zero every single time. The brand overall seems to have a following where customers will use Burris mounts on every rifle they own. Some of the downsides we came across were some customers thought this was a 100% US made product. It’s, in fact, a US Company but some of the products are made in China. That being said the product doesn’t lack in quality because of this. Some other customers had trouble adjusting the tension on the camming screws. You can’t tell by shaking the scope but if your shots are stringing this is likely the cause and the cam screws need a little tightening. So overall this product seems to hold its ground as a top choice for an AR15 quick release scope mount. It falls between the middle-high level of pricing out of the other 4 options but I wouldn’t hesitate to pick this mount up if you’re able to swing it. This mount comes as a 2 piece set of individual rings. This gives you some more versatility if you’re using a wider array of scopes that require different positioning but that’s really only a benefit if you remove the scope often or just need a more flexible mount due to your scope. One of the more obvious differences is the price of this product. At the time of this writing, it’s the cheapest on our list out of the 5. If you’re on a budget and need the best quick release scope mount for the money these will definitely get you by. Additionally, if you need backup mounts and aren’t able to fork out more money for each scope you have then these can be ideal placeholders. UTG promises easy repeatable positive locking for optimal re-zero performance with these mount rings. At this price point you could pick up 2 pair just to test out and if things don’t work out you’re not out much money. Customers have bragged about how well these rings have held their scopes at zero. Even through multiple dismounts and mount tests and much traveling in cases customers seem to be very happy with these. One thing that customers keep bringing up is that these quick release rings have exceeded their expectations since they were so cheap. They aren’t as high quality overall but they do what they need to. One drawback that we noticed was from customers using these rings on smaller rifles. They just stated how the lugs appear a bit large on a smaller rifle so it may cosmetically look odd. However, if you’re using these rings on your AR15 you’ll be good to go. The American Defense quick release mount is focused around 2 things. Being very easy to use and being very high quality. You don’t need any special tools to remove or attach this mount. It can be done using your fingers or a flat head screwdriver. The locking lever can be changed to the front or rear for a more comfortable position. The clamping surface is extremely well crafted and insures maximum rail engagement. This gives you a sturdy surface and base for your scope. To top all that off this product is 100% made in the United States. You know that when it comes to these quick release mounts their ability to hold zero is very important. Well, this optic mount holds zero like gorilla glue. Customers repeatedly give this product a 10 out of 10 and we weren’t able to come across a single person who didn’t have confidence in this mounts abilities. Nearly any issue you come across in other mounts including damaging top rails, difficulty in installing or removing, being odd when it needs adjustments, and other problems are nearly non-existent when compared to the American Defense AD-Recon STD Riflescope Optic Mount. The biggest downside we’ve seen coming from customers is the cost of this mount. It may be high quality and considered one of the very best but not everyone can afford these. I think it was best put by a customer that said “I own one of these and it’s the best I’ve ever had. I’d own another one if it wasn’t so expensive”. Quick detachable (QD) mount allows you to remove or replace your optic quickly and easily. 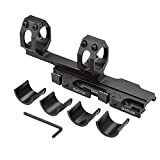 Use this cantilever mount for mounting 30 mm or 1" optics onto most flattop style rifles. Available with an extension to mount the scope in a forward position for the ideal eye relief and head placement. The mount is compatible with Picatinny/Weaver style rails and holds your scope's optical axis at a height of about 1.59'' above the rail. Extremely lightweight 7.95 oz. aluminum construction, durable matte black anodized finish. The Twod 1″/30 allows you to mount 30mm or 1″ optics with a quick release for removing or replacing your optic quickly and easily. The extension allows you to mount your scope in a forward position so you can find your ideal eye relief and head placement. This mount is compatible with Picatinny & Weaver rails and holds your scopes optical axis at around 1.59″ height above the rail. The entire product is made of aluminum constructions with a matte black finish and is very durable. This detachable AR15 scope mount falls in the lower price range at the time of this writing out of our 5 picks. So if you’re on a budget this is one QR mount to keep your eye on. Customers tend to like this product for what it delivers at this price point. The mount tends to hold zero but there has been some trouble with the quick detach coming to lose for a few people. Some people also had issues with the nuts and bolts not allowing them to tighten the mount enough. This mount also doesn’t work for every single scope. So make sure your scope is suitable for this mount before making a purchase. Overall among the customers, we’ve seen they are mixed reviews. Known for tightening issues caused by the nuts & bolts. The Flat Top Offset One Piece QD Scope Mount is an excellent mid-range mount. This mount installs very quickly with a finger adjustable quick release cam locks. It has an offset design for more ideal eye relief position and it’ll work with both 30mm and 1″ main tube rifle scopes. It’s crafted from aircraft grade aluminum alloy and has a sleek modern appearance. The mount fits onto flattop Picatinny rails. The best feature which we would like to re-highlight here is the finger adjustable quick release. This is a highly convenient feature of this rifle scope mount. Customers have stated that it’s well made for the money with some people using this mount for a couple of years. They’ve all stated how well it fits their Picatinny rail AR15’s. Most people tend to enjoy this product and everything about it is mostly positive. However, there were some adverse comments about how well this mount holds zero. Some customers didn’t have any issues with it while others stated it wasn’t holding zero after being removed and replaced. If you have a single scope this won’t be a problem but then again it would defeat the purpose of needing a quick release mount. As it stands the ability of this product to hold zero is indecisive. From what we were able to examine it could be user error and not a flaw of the product. Some people state they’ve had issues with this mount holding zero. How well do quick release scope mounts hold zero? – Most well made quick release scope mounts hold there zero very well. We’ve only come across a few where there were enough people that had issues with the mount holding zero that it became an issue. Most QR mounts hold zero quite well. Should I use a detachable mount on my AR15? – If you’re anything like my friends and me, we end up changing scopes quite frequently and go shooting a couple of times per month if possible. With that in mind, I don’t know what I would do without having a AR 15 scope mounts quick release. At this point, I’m not looking back to any other type of scope mount. Is there a different rule of thumb for positioning a QR mount? – No, there’s nothing different about the way you position your QR mount compared to how you position any other scope mount. You just want to keep it mounted above the upper receiver of your AR15 and find a position that suits your eye relief. Ok, so the absolute winner in the 5 best AR 15 scope mounts quick release is the Burris 410344. This scope mount just has the best of all worlds really. It’s at an affordable price point, has the ultimate quality, and overall outperforms other detachable scope mounts. I can recommend you get this product with complete confidence and know you’re going to be very satisfied with the item. With all that said I hope you enjoyed this article and maybe learned a couple of things. Please leave a comment below to share your thoughts on quick release scope mounts and share this article with a friend. Thanks for reading and here’s an article on how to use red dot scopes you may enjoy or this one on optics for the AR Pistol.